The advancement of signalling has been driven by the need to control train movements in the most efficient manner whilst optimising the capacity of a given layout configuration. Progress has been achieved as a result of technological developments, new legislative requirements, and the all-important lessons learned from accidents and incidents. This article introduces a major new book that charts the evolution of signalling, and also indicates some additional sources of technical information about signalling for those wanting to learn more. Network Rail has about 40,000 signals across the whole network, controlled by a variety of mechanical, electrical and computer systems, mostly behind the scenes. 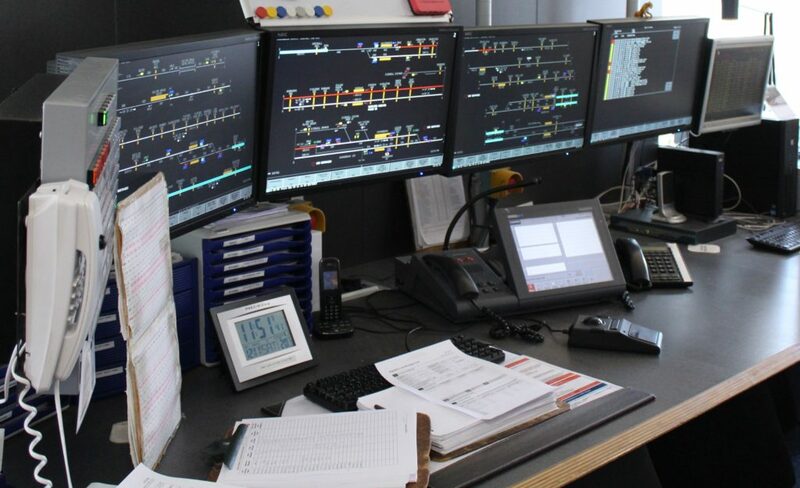 The signalling system in live action may be observed on Open Train Times (www.opentraintimes.com) and other similar websites that provide a much-simplified version of the workstation or control panel that the signaller is operating to control train movements. Watching complex areas such as Liverpool Street and London Bridge during the peaks, it is difficult for the general user to appreciate the vast amount of complex technical kit that provides for the safe separation of trains and intense working at busy junctions and in station areas. Robust safeguards are built into the interlocking to prevent signaller error compromising safety. Integral to the signalling system, driver aids such as the Automatic Warning System (AWS), and Train Protection Warning System (TPWS) play their part to ensure driver compliance with signal aspects. Automatic Train Protection (ATP) systems overcome weaknesses in the AWS/TPWS combination by continuously monitoring train speed and automatically implementing corrective action should a driver fail to comply with signal aspects or speed limits. Free standing ATP ‘trial’ systems are in operation on the Great Western main line and the Chiltern line. However, ATP is a component of the European Train Control System (ETCS) that Network Rail is gradually implementing. These vitally important safety systems have been introduced in response to lessons learned from train accidents. 20-lever frame at Acle signal box, Norfolk. In the modern age of personal computing, consisting of devices that are ‘upgraded’ every few years, newcomers to the industry may be surprised that train movements in some areas of the country, including the busy West Coast main line in the Stockport area, are still controlled by nineteenth-century technology, with signallers pulling levers. Elsewhere, mid-twentieth-century control panels are still in service, with signallers pressing buttons to set routes. Computer control is being increasingly implemented since the first digital Solid State Interlocking (SSI) was commissioned at Leamington Spa in 1985, but conversion of the whole network is a long-term project. So how has it come about that we have such a diverse range of technology in use today? Many a proposed scheme has had to be de-scoped when money has run out. For example, mechanical lever frame signal boxes continue in service at Clacton and Stockport, interfacing with adjacent modern signalling centres. Even in the 1960s, new power box schemes were opened controlling a reduced route mileage compared with what was originally planned. Towards Stoke-on-Trent via Uttoxeter was excluded from Derby Power Box, as was the Northampton loop from Rugby box, although the latter was incorporated some years later. A mid-1980s resignalling of Shrewsbury was shelved leaving the lofty 1903 LNW tumbler frames at Severn Bridge Junction (180 levers) and Crewe Junction (120 levers) still in service today! Despite predictions to the contrary, the skills of the mechanical locking fitter are still with us today, and points and signals operated by metal wires and rods are more durable than those controlled by electrical wiring, the insulation of which may degrade over time. Signalling must be designed, installed, tested, commissioned and maintained by staff working to high professional standards in compliance with a series of specialist internal company standards issued by Network Rail. 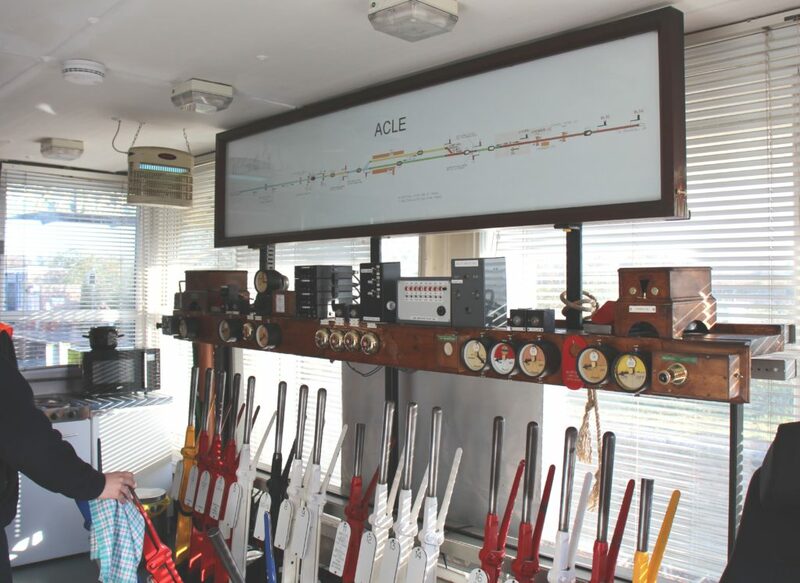 Staff competence is also vitally important and signal engineers are required to hold an Institution of Railway Signal Engineers licence for the category of work that they undertake. The various factors described above contribute to the overall cost of signalling. It has always been challenging for the industry to justify that the capital cost of signalling improvement schemes will achieve payback in some way such as staff and maintenance savings, or improvements to capacity. The way in which various factors, including those described above, have played a part in the continuous improvement of signalling since the early part of the nineteenth century are described in a new book – A Chronology of UK Railway Signalling, 2nd edition. This monumental hardback tome of nearly 500 pages from Peter Woodbridge and his contributors provides a fascinating insight into the evolution and innovation of signalling from the invention of the Leyden Jar (capacitor) in 1746 to the fibre-optic axle counter sensor of 2017. 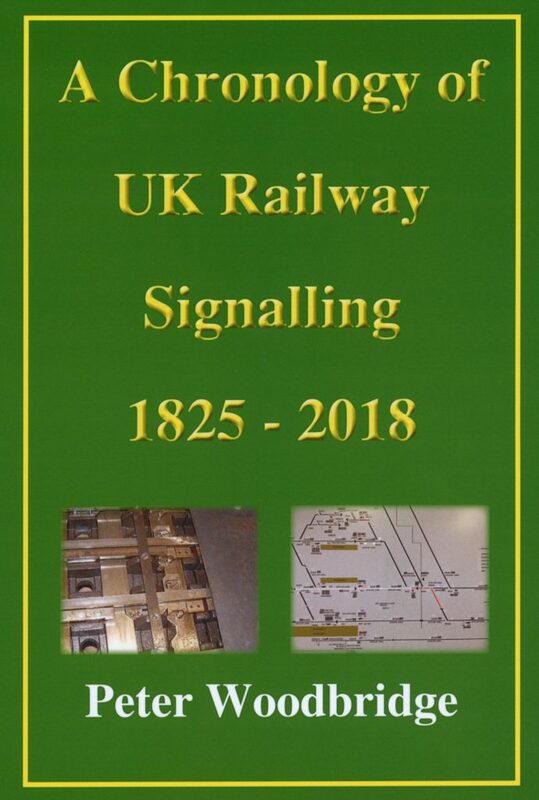 This chronological synopsis of significant events in the development of railway signalling covers all UK railways but concentrates on ‘mainline’. The one-line event index, split into categories such as accidents, block working, companies, land legislation, is listed in chronological order, acting as an at-a-glance evolution summary and directing readers to the appropriate year in the main body of the chronology. Here, the aim is to present the overall story of the evolution of all the elements that comprise railway signalling and give the general ‘big picture’ of how, through innovation, accidents, legislation and pure chance, we have today’s signalling. The story starts with the Stockton & Darlington Railway of 1825 and an early attempt at providing signalling comprising braziers (fire baskets) into which burning coals could be hoisted as a stop signal. The section concludes with fifteen entries for 2018 including accidents at an AHBC (automatic half-barrier crossing) and a UWC (user-worked crossing) and, more positively, the first Automatic Full Barrier Crossing Locally monitored (AFBCL). Two short sections describe the development of the former Western Region’s E10k relay interlockings, and Geographical relay interlockings used elsewhere, many examples of which are still in service including the 1960 Plymouth Panel Box, and 1966 Birmingham New Street station area Westpac MkI interlocking. The final section contains an extensive thought-provoking summary of significant accidents spanning 162 years involving signalling design, operation, maintenance and modification. The lessons learned have shaped today’s signalling system, which plays a vital role in the safe and efficient working of trains. However, the recent collision at Waterloo is a wake-up call that the causal factors identified in past accident investigations must not fade from the industry’s collective memory. The book concludes with a selection of colour photographs illustrating Peter’s signal engineering life. Technical terms are clearly explained making it an easy read suitable for a wide audience. At £30 plus postage it is NOT currently available from online retailers. Proceeds go to Swindon Panel Society, which has preserved the Swindon Entrance Exit (NX) panel at Didcot Railway Centre with train movements, control and indication of outdoor functions such as points and signals simulated by computers. This free online resource, fully updated in January 2019, is produced by Andrew Overton and hosted on the website of the Signalling Record Society (www.s-r-s.org.uk/archivebpsr.php). The documents are aimed at signal engineers but will be of interest to anyone wanting to know more about power signalling. The first component is a PDF document providing a comprehensive introduction, glossary and detailed explanations of interfaces, power frames and interlockings, concluding with a colour pictorial guide to interface and interlocking designs. The register itself is an Excel spreadsheet with three tabs ‘Interfaces’ (signal box or workstation), ‘Interlockings’ and ‘Power Frames’, the compilation of which evidently involved extensive research since coverage includes all power signalling equipment commissioned in Britain from 1883 to date excluding London Underground and metro networks. Railway Signalling – Although published in 1981, it is still relevant today with descriptions of the principles of signalling layout, interlocking and controls. Relays, points, track circuits, remote control and train describers are covered. Railway Control Systems – This sequel from 1991 includes Solid State Interlocking (SSI), Single line working, level crossings, operator interface and Automatic Train Protection. Railway Signalling and Control – This further sequel brings the story up to 2014 and includes the various computer based interlockings, axle counters, point operating mechanisms and stretcher bars, AWS, TPWS, Tilt Authorisation and Speed System (TASS), ETCS, HS1 signalling, and signal sighting. Of course, you can just continue to read your favourite railway engineering magazine Rail Engineer. Almost every issue contains at least one article on railway signalling, its technology and concepts, and these are reproduced online on this site. David Bickell joined British Railways as a student engineer in 1968, undertaking a work-based training programme covering all aspects of signalling and telecommunications. His career took him through various roles in Derby, Crewe and Nottingham before, in 1996, he was posted to London as Standards Engineer, Control Systems at Railtrack headquarters. A spell as Signal Area Maintenance Engineer in Kent was followed by that of Regional Signal Maintenance Engineer at Liverpool Street and York. His responsibilities included the management of general safety regimes, including SPAD mitigation, and being Chair of the Signal Sighting Committee. David retired in 2005 as Signal Standards & Assurance Engineer for Network Rail, managing its portfolio of signal engineering standards and sitting on the RSSB Group Standards Signalling sub-committee. Since then, he was a visiting lecturer on railway signalling at Sheffield Hallam University and has been writing for Rail Engineer on major signalling projects since 2013.